(1) make a grocery list (2) scroll through Facebook (3) pound steering wheel (4) scan the radio for a better song, or (5) curse the pipe for breaking. We know everyone hates traffic, road closures and construction. But the next time you are sitting in traffic cursing because there is ANOTHER water main break, think back to this article. You will still be in traffic but at least you won’t be as mad at us (insert sheepish grin). Water main breaks are a normal part of managing a water distribution system, yes really. Unfortunately when they occur they can cause property damage (not good) and shut down roads for lengthy repairs (Really Not Good!). So why do they break? Let’s first learn about the types and sizes of these pipes, commonly referred to as mains, underneath the Queen City, then we will get into why these pipes can sometimes break, and cause water to rush out onto the street. 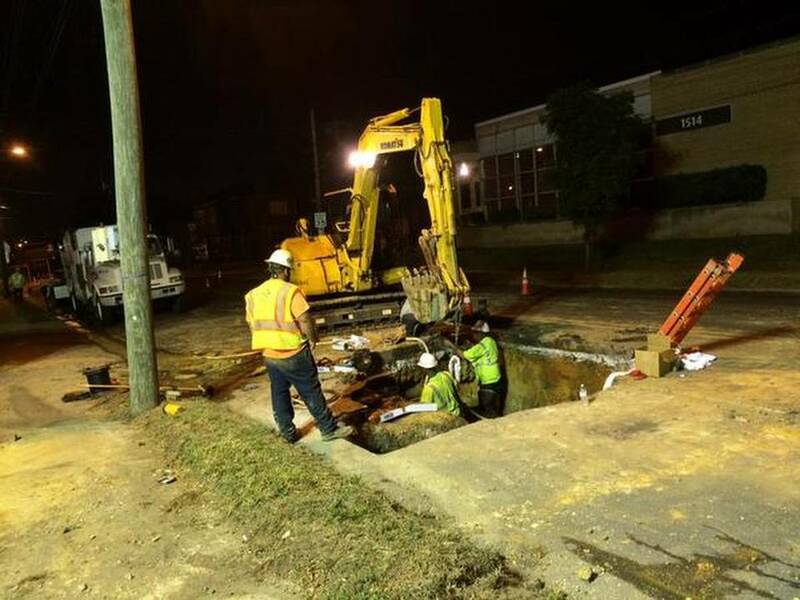 Mecklenburg County has about 4,209 miles of water mains to maintain. They are all different sizes from 8” in diameter to 102” in diameter! You could fit a small car through some of them (please don’t try that), just trust us. 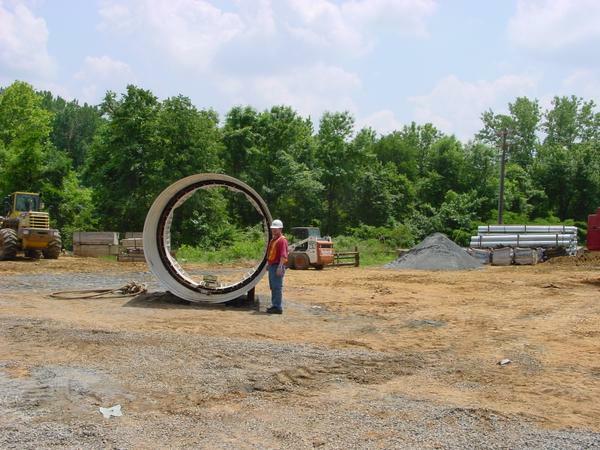 Many of our smaller pipes are made from PVC pipe while the larger ones are made with ductile iron. Most of these pipes have been put into the ground at various times throughout the last 30 years; about 1% is up to 80 years old. Yep, so old there wasn’t even a vaccine for polio yet. Can you imagine having to make sure all 4,209 miles of underground pipes are not leaking and working properly EVERY DAY? No? Try Again? Still can’t imagine? That is because it’s a big task AND this doesn’t even cover the additional 4,000 miles of sewer pipes (we will leave that for another time). Our staff has a GIS program that shows the location of all of the pipes underground (very cool). Unfortunately, the program can’t tell us if those pipes are leaking or if they are likely to break. Leak detection staff checks pipes as much as possible but breaks still happen which is why we have a team of skilled staff members that are on call 24/7 to make sure any leaks that have been reported are dealt with as quickly and as efficiently as possible. All leaks are a priority, but utility crews maintain more than 8,000-miles of water and wastewater pipe and the timing of maintenance is based largely on (1) severity, (2) date of notification and (3) workload. Leaks posing a potential threat to health and safety are classified as emergencies and always receive immediate attention, think sinkholes, wastewater leaking out into a busy street (yuck), water rushing into houses (real bad stuff). Other leaks are repaired based on severity – the amount of water loss, the potential for pavement or property damage, etc. Depending on workload, the response time can sometimes be a little longer than our customers would like, for the smallest leaks. Now that you have a better understanding of what we are dealing with let’s get into why pipes could break. Construction crews hitting mains during groundbreaking, Call 811 before you dig to locate the pipes people! Weak seals, no not those seals! Phew that is a lot of reasons! We will never truly know what the cause is for each main break because it all happens underground; but we can speculate and make deductions based on the type of break, current conditions and other factors. So what should you do if you see a leak? Call 311 and we will send staff out as soon as possible to check on it. Also make sure to follow us on twitter for up to date water/sewer related alerts.